When you look at your brick chimney or wall and notice that the joints between the bricks are soft and crumbling, maybe even with pieces missing, the chimney needs repointing. This is a needed repair that when done in time can prevent more serious damage. Often times only a portion of the chimney or wall needs repointing while the remainder remains in good condition. Some photos of repointing may be seen on our Masonry Gallery page. After your chimney has been repointed, consider waterproofing it to help prevent the problem from recurring. We also offer masonry restoration work and waterproofing on stone, brick, and block buildings or homes. At Al Menting Mason Contractors, we take care to provide our customers high quality services personalized for their unique needs. We are available to take your order 24 hours a day, 7 days a week. Our staff members are professional, courteous and efficient. This is a repair that is best made when the temperature is suitable; so, don't wait until the dead of winter when you are threatened with the loss of heat! Please take a look at some of the chimneys which we have rebuilt. After your chimney has been rebuilt, consider waterproofing it to help prevent the problem from recurring. Our interior basement waterproofing system consists of all work being completed inside the basement. The floor is opened next to the outside walls, and a drain tile is installed. 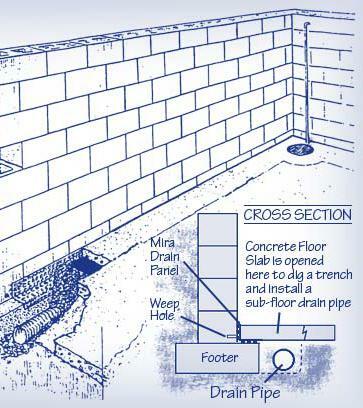 The drain tile system collects any water that is under your floor – it acts as a funnel that will move the water into the drain tile. We surround the drain with gravel to keep it clean. Once this is completed, we connect the drain system to a sump pump, which discharges the water into your yard. Newly finished concrete floor covering system will be suitable for floor tile or carpet. BASEMENT WINDOWS- We also provide service for basement windows that leak. FOUNDATION CRACKS- We connect foundation wall cracks to existing drain-tile systems. These systems come with a transferable lifetime warranty, so that you can have peace of mind and added value in your home. Our waterproofing is 100% effective and it is guaranteed for the life of your home with a fully transferable warranty. Rest assured knowing that your job will be handled by professionals with thousands of satisfied customers behind them.